Tag Archive | "Daphnia (Daphnia pulex)"
Daphnia (Daphnia pulex) is the most common freshwater species known to tropical fish keeping enthusiasts as Water Fleas, Moina, or Water Bugs. They inhabit almost every slow moving, nutrient rich body of water as plankton in open water lakes, living mainly in the upper portion of the water column near the algae rich surface, or attached to submerged vegetation on or near the bottom. They are too small and weak to survive in strong currents. Daphnia pulex are used by tropical fish keeping enthusiasts as a food source for their fish and to clear green water and debris from their tanks. Daphnia pulex are easy to culture, fast growing, super nutritious, and very popular as a live fish or Axolotl food. Because they are small, cheap, easy to keep alive, and have a transparent shell that makes their internal functions visible, scientists also widely use Daphnia for experimentation. Daphnia pulex are smaller (.008 to .12 inch in length) versions of Daphnia magna, a larger cousin to Moina macrocopa, and the small cousin to Simocephalus vetulus. They resemble a land flea in appearance and movement, and like all crustaceans have an outer shell that they molt as they grow. In the wild, Daphnia pulex will only live about ten to thirty days, but in a controlled, predator free environment, they can attain 10 to 20 growth periods and live up to 100 days. 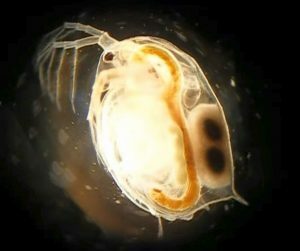 Daphnia pulex have a transparent, folded, shell like carapace, four to six pairs of flattened thoracic legs that are used to filter algae, bacteria, and detritus, a hook shaped intestine with two digestive cavities, and a posterior ventral opening. They have large, dark colored compound eyes, two pairs of antennae on their head, and rows of small spikes along the back. Male Daphnia pulex are generally smaller than females, have longer antennae, and have a modified post abdomen. Female Daphnia pulex have a brood chamber located between the body wall and top of the carapace that is used to carry their eggs and are larger than males. Daphnia pulex are prolific breeders and reproduce sexually as well as asexually in a process called parthenogenesis. Sexual reproduction occurs during less favorable conditions, mainly during the winter months when lower temperatures, overcrowding, less food, and accumulation of wastes is highest. Males copulate with the females to form fertilized eggs which are then kept in the female’s brood chamber and hatch out primarily as males. Parthenogenesis occurs during more favorable conditions in the summertime when entire populations of Daphnia pulex consist almost entirely of females. Parthenogenesis begins when the female molts her carapace as she grows and even without fertilization from the male, develops anywhere from two to twenty eggs in her brood chamber. The eggs develop into immature females that are released during the next molt. The young produced in this manner are more well developed than those produced sexually. Although parthenogenesis is most used for rapid increases in Daphnia growth, it requires more favorable conditions than for sexual reproduction. Daphnia pulex can be cultured in anything that holds water and is suitable for housing fish. The proper size container depends on the amount of Daphnia you will require to feed your fish. If you have only a few fish, start with a 20 gallon tank indoors. If you are a breeder and have several species to feed, an outdoor pond, large cattle trough, fiberglass container, or even a plastic child’s wading pool would be more appropriate. Anything that will maintain a seed culture for starting and feeding your daphnia will do. If you are culturing Daphnia pulex indoors, you need to keep the culture from sudden changes in temperature, provide them enough light, and enough air in the form of large bubbles to break up any surface film. Aeration is not necessary in outdoor containers. Daphnia feed on phytoplankton in the water column; basically green water and protozoa. A large culture of daphnia can clear a pond of green water almost overnight, so feeding them green water over an extended period of time is not practical. An equal part 1 1/2 gram mixture of yeast , soy flour , and spirulina mixed into a glass of warm water (to activate the yeast) until fully dissolved, and then stirred into 2 liters of pond or aquarium water produces enough food for an established 80 gallon Daphnia pulex culture. To feed, pour the suspended mixture evenly around the culture. An 80 gallon outdoor culture should be fed daily during the warm summer months, and every 3 or 4 days during the cooler months. Do not overfeed your daphnia cultures, you can always add additional food if they are underfed and monitor the results. If you have been underfeeding your cultures, the number of daphnia should increase. The container water should be clear before you feed the culture again. If it is not, you are overfeeding the dapnhia. When conditions are not to their liking, Daphnia pulex will die off. Daphnia need a pH around 7.0 and the same water conditions as any other aquatic species. When conditions improve, they seem to mysteriously reappear. An indication of a healthy culture is when all stages of daphnia are present. When no juveniles or larvae and only adults are present, it is an indicator that the culture is not doing well. A sudden culture die off is almost always due to poor water conditions caused by overfeeding. When this occurs, change the water in the container and let it get green, but keep the sediment on the bottom. The debris on the bottom contains dormant eggs which will hatch into a new colony, or you can replenish the culture by adding more daphnia. When the water begins to clear up again, the new culture has regenerated and needs to be fed. Outdoor containers are subject to dragonfly and mosquito larvae infestations. Wrigglers eat the same food you are feeding your daphnia and compete with them. The plus side is that you can harvest the mosquito larvae and feed them to your fish along with the daphnia. It’s a good idea to always keep several cultures of Daphnia pulex going in case one suddenly dies off. A quart jar or two houses enough Daphnia to easily repopulate an outdoor pond or an indoor aquarium.